Our story starts in National City, where Batgirl stalks Red Spur, a cowboy themed villain, on the rooftops of the city. Supergirl arrives and lends a not-so-needed hand to Batgirl. The two heroines let him get away, as Batgirl explains that she has a tracker on him, and will get him tomorrow. 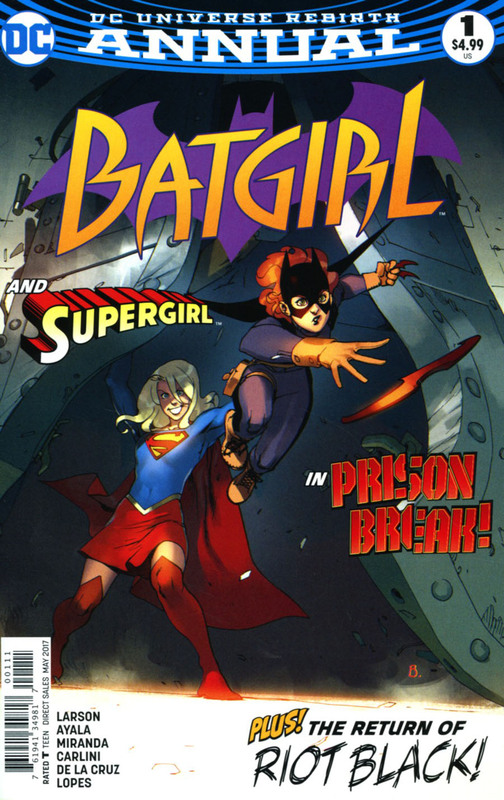 Supergirl explains she needs Batgirl's help in rescuing someone from the Cadmus Black site. Someone that has been sending her telepathic messages. Supergirl suspects that whoever it is could be Kryptonian as they communicate with her in her native tongue. Supergirl can't go in there alone, as if she is spotted, she could get into a whole lot of trouble as an illegal alien on Earth and the DEO. Batgirl agrees to help and the two of them are off. Once the female finest duo get to Cadmus, they manage to break in easy, and then come across a guy by the name of Frostpoint. He has extreme weather powers, and is in some kind of trance. Supergirl is able to defeat him and snap him out of the trance. They take him with them, and finally find the psychic they came to rescue, a female by the name of Gayle. Gayle tells Supergirl that she is able to communicate with her in Kryptonian, and she needs to get to the Phantom Zone, as there is someone in there that can "fix" her. Gayle says she needs Supergirl's power to get there. She holds the three of them at bay with her powers and manages to drain enough out of Supergirl and disappear. Batgirl, with Frostpoint in tow, carries Supergirl out of Cadmus before they are found. Later the two girls sit in the Mojave desert and reflect upon the events of the night. Story - 4: Now before I proceed, I'd like to tell everyone that I only reviewed half the Annual, as that was the only story that featured Supergirl. Please forgive me if you thought it deserved a higher grade, I just don't collect either of the Supergirl or Batgirl books, and I'm unfamiliar with what's happening in their respected storylines at the moment. This was an alright story. I could easily see it being an animated episode of Justice League. I enjoyed the back and forth banter from the girls, and the tight continuity from Supergirl's book spilling into this Annual. The follow up to this will be in Supergirl #9. So enjoy the sense of continuation of the story. Sadly I don't read either of the titles, but it was a good story regardless. I found that it was a little too easy for the girls to break into Cadmus unnoticed, but since this story only took up half the book, I guess pacing would have been a key factor. I have been covering General Zod over in the Suicide Squad title (see my "Elsewhere in the DCU" reviews), whom has escaped the Phantom Zone recently, so I hope with Gayle going in there this issue, we hear about it or at least acknowledge the goings on in the other books. I'm a stickler for continuity, if you can't tell. Art - 5: Now this part of the book I couldn't get enough of. Inaki Miranda did such an awesome job, I felt I was watching an episode, rather than reading a comic. Such fluid panels that flowed perfectly into one after the other, this issue was a great showcase for his talent. This was my first exposure to Inaki Miranda's art, but I'll surely keep an eye out for future stories rendered by him. What impressed me the most was the way he made Supergirl's Rebirth (heavily inspired from The CW show) costume look so good. Even the hideous knee high boots looked like they worked. Part of the main reason I stopped reading the on-going Supergirl title was that the art didn't do much for me, but I would read that book all day long if Inaki was the regular artist. He even made Batgirl look good, and her costume is one I really hate. I loved the opening page as Batgirl hangs upside down, with her cape wrapped around her. Something no artist has really done before. Also the body language for both girls, they actually feel like they are in a real situation, rather than looking as if they were posing for a comic panel. However, I must mention that some of the facials at times looked flat, and that as the story progressed, the figure work did start to look a little stiff. Regardless, I really liked the art, and would love to see more from him. He'd be a good fill-in artist for Jorge Jimenez on the Super Sons book form time to time. The art coupled with some decent colors by Eva De La Cruz, made it a joyful read. Cover Art - 5: The cover is by Bengal, and for those that are unfamiliar with his work, he is one of the creative minds at Capcom, specifically the Street Fighter series. I've loved his art for years, and it's great to see him tackling some American comics, especially DC. It's a great layout, it perfectly captures the attitude of this current versions of Kara and Babs.